Why is there no level playing field when it comes to encroachment in India? Certain things are best avoided! What happens when you are witness to a gruesome incident? You try to avoid seeing it, because it is “unbearable”. But, will the clouds disappear if you bend? A big ‘No’. And, how long can one look the other way? The reality will dawn on us one day. There is no escape from it. I am referring to the tragic death of Kulsuma Begum. But alas! Did she die or was she killed? On March 4 last, the authorities concerned in Karbi Anglong carried out an eviction drive near the Langkaijan Forest Reserve along the Hojai-Karbi Anglong area. 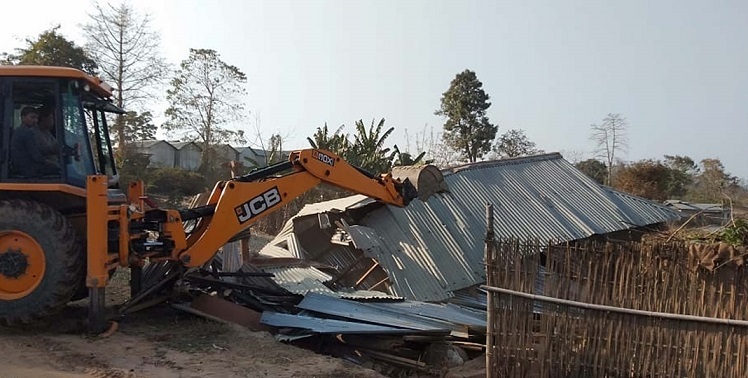 The Karbi Anglong Autonomous Council (KAAC) administration led by CEM Tuliram Ronghang spearheaded the drive to evict “illegal Bangladeshi encroachers” who had constructed many houses in the area after allegedly taking permission from the village headman. The eviction drive was met with violent protests and pregnant Kulsuma got grievously injured and passed away after a week. How does one react to such an incident? We still do not know the condition of the people who were evicted from Langkaijan Forest Reserve. We still do not know whether they are illegal Bangladeshis or just landless families like many other families scattered all over Assam. It is easy to call people illegal settlers. And the easiest thing in Assam is to call people illegal Bangladeshi migrants. In Assam, nay in India, it is very easy and convenient to dub a section of the religious minority as illegal migrants because of their looks and socio-economic status. But, it is equally difficult to prove that they are illegal migrants from Bangladesh. Let us brush this issue aside and come back to the issue of encroachment. Who are the encroachers world over? No, I am not trying to dilute the issue, rather taking it head on. There are two kinds of encroachers. One is very rich and the other is very poor. The encroachment by the rich is silent and legalised. They are protected by the state and its administration. There are many ways of legalising the encroachment by the rich and the super rich. I have heard that a powerful minister in the previous government and also in the present government has amassed countless landed property in many prime locations in the city of Guwahati. The administration of the state is always hand in gloves with such powerful and super rich people. Didn’t Ramdev Baba encroach the elephant corridor in Assam with the blessings of the state government? Such legalised encroachment is pushing the marginalised people out from their original place of living. The encroachment by the rich is a silent kind of encroachment. It is called “invisible encroachment”. But, the poor and marginalised people are seen everywhere and very soon they become eyesores! By writing all this I am not trying to support illegal encroachment. The poor illegal settlers are in perennial fear of losing their lives – elephant menace and, of course, bulldozers razing their huts down. Illegal encroachment has its own socio-political reasons. It is easy to call them illegal migrants and blame everything on them. You can ill- treat them, attack them and even allow a pregnant woman to die. But, will this solve the problem of encroachment? The poor encroach as they are landless and in search of livelihood. A lot of people become landless and live in abject poverty due to erosion and changing course of rivers every year. A lot of people are coming to the urban areas every year looking for jobs and seeking new means of livelihood. There is no record on them. Getting the accurate data in a country like India is almost a Herculean task! One does not realise the plight of these landless people unless one comes across cases like that of Kulsuma. Just imagine how much pain pregnant Kulsuma went through. She had no other place to go to other than living as an illegal settler in Karbi Anglong. She might have been an illegal encroacher, but how could the authorities be so harsh on her? Isn’t it violation of human rights? How can responsible people behave in such a despicable manner with a pregnant woman? First and foremost, it is a crime. It is a case of worst form of human rights violation. The Assam government should institute a probe into the matter and the guilty should not be spared.